The Estonian, driving a Toyota Yaris, won ADAC Rallye Deutschland by 39.2sec, three weeks after success in Finland. It was his second consecutive win on Germany’s tricky asphalt roads after triumphing 12 months ago in a Ford Fiesta. He dropped just one point here after a maximum haul in Finland, closing to within 36 points of FIA World Rally Championship leader Thierry Neuville and 13 adrift of Sébastien Ogier after counting himself out of the battle two rallies ago. Four rounds remain. The 30-year-old was coy about his chances. “I don’t know about a championship challenge but it’s great to win this specific event. This morning was very, very tough. Seb was pushing so hard and it was difficult to keep up with him,” he said. 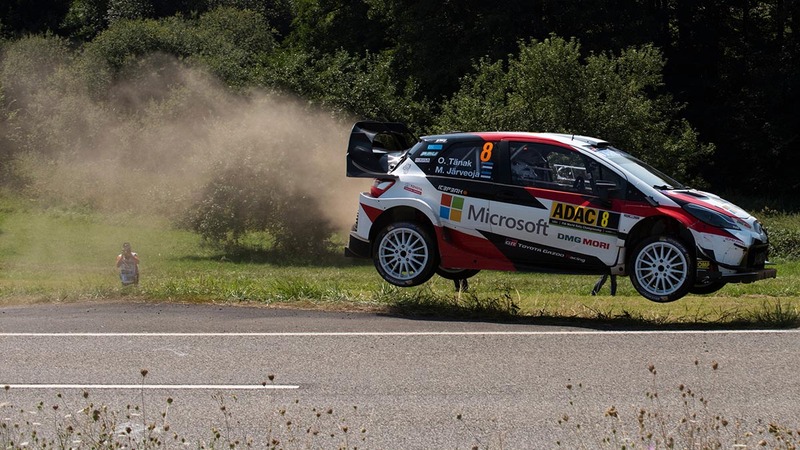 Tänak was only headed for one stage on Friday morning and laid the platform for success with a crushing drive over zig-zag Mosel vineyard tracks. His task eased when Ogier stopped to change a damaged wheel yesterday and plunged down the order from second. Neuville couldn’t match Tänak as he struggled with his i20’s handling. He inherited an unexpected second place when a fierce fight for the runners-up position between Jari-Matti Latvala and Dani Sordo ended in disaster for both drivers this morning. Latvala, holding a 0.8sec advantage over the Spaniard, retired his Yaris in the opening test with hydraulic problems while Sordo crashed his i20 into the vines. He limped through the stage but a water leak in the engine forced him out. Esapekka Lappi finished third in another Yaris, 60.9sec adrift of Neuville. It was the best sealed surface result of the Finn’s career. Ogier’s dreams of a sixth title took a severe knock when he dropped to ninth yesterday. He threw caution to the wind and two stage victories in his Fiesta today promoted him to fourth. Allied to maximum Power Stage bonus points, he conceded only two points to Neuville. Team-mate Teemu Suninen finished fifth on his asphalt debut in a World Rally Car after leapfrogging an out-of-sorts Andreas Mikkelsen, who struggled with the handling of his i20.